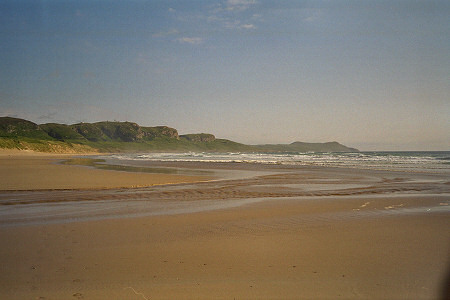 This picture is from my second ever visit to Islay in 1999, returning after discovering Islay in 1998. I didn't write as detailed travelogues back then as I do now, so I can't really give much detail about the circumstances of the day apart from that it was fantastic but quite windy that day. Oh, and I had been terribly sunburned the day before, I think when walking along the beach at Killinallan Point towards Gortantaoid Point. I remember that much, and how much it hurt. Or in other words, you can get sunburned quite badly in Scotland and in particular on Islay. Don't forget your sun lotion!